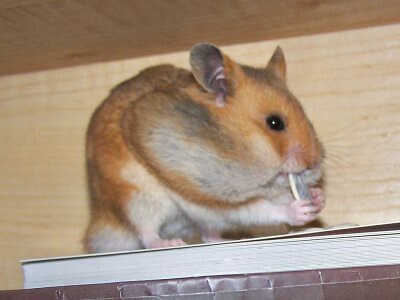 My brother's hamsters used to do that, fill their little pouches full to bursting, so cute! It looks like your hampster is kissing the little mouse with the umbrella. What a cutie. My kids would die to have one of these fuzzy little creatures. The bottom photo is just adorable. Great shot. Aw, that is so cute. The little hamster is adorable. Aww too cute! 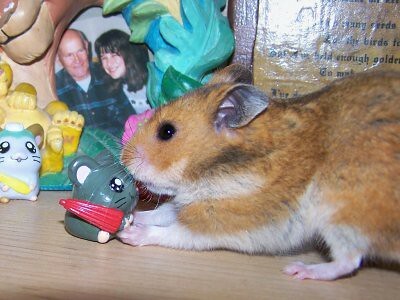 I used to have hamsters years ago. The one I got from the store was an albino one who turned out to be pregnant. That's how I ended up with hamsterS instead of a hamster...LOL Thanks for sharing your pics!